Wilmington's Mr. Celery celebrates a Blue Rocks run during their 6-1 victory over Lynchburg on May 24. There was nothing out of the ordinary about Anthony Seratelli’s RBI sacrifice fly that increased Wilmington’s lead over Lynchburg to 6-1. And what followed, however strange, was expected. Mr. Celery, a green foam mascot in the shape of a stalk, dashed from underneath Wilmington's stands toward the home plate dirt circle. He stopped to face the crowd, did a celebratory dance, ran to the backstop to high-five some fans, then disappeared back under the stands. As weird as the ritual may sound, it’s how the Blue Rocks celebrate runs. Mr. Celery has been celebrating Wilmington runs since 2000. Blue Rocks General Manager Chris Kemple adapted the idea from the pink bunny that emerges from the outfield wall to celebrate runs for the Lake Elsinore Storm. “I thought it was one of the most hilarious things I’ve ever seen and figured that we had to somehow incorporate that idea in Wilmington,” said Kemple, who first saw the bunny while attending the 1999 California League All-Star game. In the late 1990s the operators of Wilmington’s concession stands had mascot costumes depicting a soda, popcorn, a hot dog and celery that they used to promote their offerings. By the year 2000 the celery stalk was the only costume still in the ballpark. Kemple didn’t want to spend a lot of money on a new mascot, so when he came across the abandoned costume, he decided to see how the public responded to a dancing celery. Wilmington fans have celebrated Mr. Celery’s rise from the garbage heap to the baseball diamond. Some started bringing celery stalks to the ballpark to enhance the odd minor league baseball promotion. One group of college students that dubbed themselves the “Celery Squad” wore hardhats and pieces of celery. The enthusiasm carries over to the Wilmington staffers who wear the outfit. 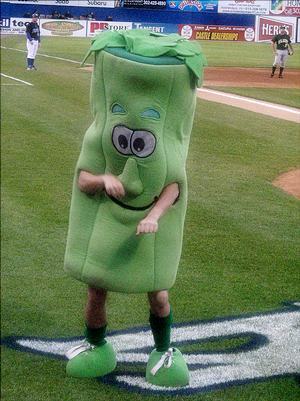 Aside from simply keeping Wilmington players off the base paths, opposing players are going to greater lengths to keep Mr. Celery from dancing. On several occasions opponents have hidden the costume. Once, Kinston players even kidnapped the outfit and wore it in their bullpen. For the most part, though, Mr. Celery remains entirely Wilmington. There have been Mr. Celery bobblehead giveaways and the gift shop has a section filled with stuffed dolls and other trinkets bearing his likeness. Wilmington is even taking the Mr. Celery celebration to a different level on June 28 by hosting a birthday party for the stalk. Blue Rocks officials won’t say how old he is, but they vow Mr. Celery will be around the park for a long time to come.